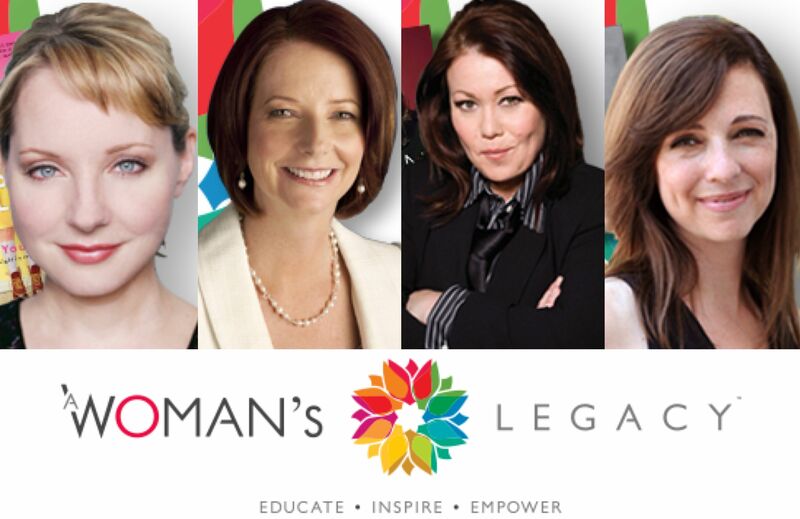 Jessica Holmes joins former Australian Prime Minister Julia Gillard, famed Canadian songstress Jann Arden, and best-selling author of Introverts Susan Cain in the incredible line up of inspirational women visiting Toronto to speak at A Woman’s Legacy Event on November 21, 2013. This annual event draws an audience of motivated women including successful businesswomen, entrepreneurs and the who’s who in the city to learn first hand from internationally renowned women. Bridging a cross section of industries to come together and be empowered. A Woman’s Legacy brings together experts who speak about their personal stories and their secrets to success in areas that cover communication strategies, motivation, smart investing, innovation, stress management and more. Jessica Holmes starred on Royal Canadian Air Farce and The Holmes Show, and is the author of I Love Your Laugh: Finding the Light in my Screwball Life. Also a Life Coach, she tours Canada with her quirky combination of humour & inspiration. Holmes has opened for comedians like Jerry Seinfeld, Leslie Nielsen, and Ellen DeGeneres, as well as hosted events for such visionaries as Deepak Chopra, Tony Robbins, and Oprah Winfrey! Although a comedian at heart, having performed with the Second City and Just for Laughs, Holmes has recently delved into writing: penning the book I Love Your Laugh: Finding the Light in My Screwball Life. Jessica majored in writing at Ryerson’s Radio & Television Arts BFA program, and again ended up spending her free time involved in comedy: acting in and then directing the annual sketch comedy show, titled RIOT. There, a few of the performers dared each other to try stand up. Four of them, Jessica included, performed at amateur night at The Laugh Resort. Jessica was hooked on the terrifying adrenaline ride that is stand up comedy, and decided to try it on as a career. During her years on Air Farce, Jessica had two children, Alexa and Jordan, with her actor husband Scott. Holmes wrote her first book, I Love Your Laugh: Finding the Light in my Screwball Life, in 2010. Having fallen in love with public speaking, Holmes decided to deepen the scope of her material by becoming a Life & Career Coach through San Diego’s Life Purpose Institute. She now enjoys a mix of comedy & motivational speaking. This entry was posted in Jessica Holmes and tagged 60 Minute Perspective Makeover, A Woman’s Legacy, Air Farce, arts, Australian, author, best selling, Biz Network, book, British Columbia, business, Canada, Canadian, CBC, Celine Dion, Comedian, comedy, conference, Deepak Chopra, Ellen DeGeneres, Entertainment Tonight, Entertainment Tonight Canada, entrepreneurs, event, famed, festival, George Stroumboulopoulos, Geri Halliwell, goals, humor, I Love Your Laugh, inspiration, Introvert, Jann Arden, Jerry Seinfeld, Jessica Holmes, Julia Gillard, Just For Laughs, Keynote, Lesley Diana, Leslie Nielsen, life coach, Life Purpose Institute, Liza Minnelli, motivational speaker, North America, November, Oprah Winfrey, Ottawa, Pivotal Media, PR firm, press, Prime Minister, psychology, Public Speaker, radio, reality, RIOT, Royal Canadian Air Farce, Ryerson, Ryerson University, San Diego, songstress, Stand Up, standup, Susan Cain, television, The Holmes Show, The Promotion People, The Second City, Tony Robbins, Toronto, Urban Retreat, Vancouver, Venezuela, WIBN Conference, women, Women in Glaucoma, WorldFest on November 17, 2013 by press.